When is it time to through out that makeup?! Gong Xi Fa Cai! It's time to ring in another Chinese New Year. 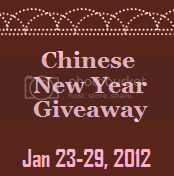 To welcome the year of the water dragon, I have teamed up with The Coffee Chic and some other awesome bloggers to bring you the Chinese New Year Cash Giveaway. Try your luck and enter the rafflecopter form to win $100 Paypal Cash or Amazon Card (Winner's Choice). Just like the Facebook pages, follow Twitter Accounts, add Google pages in your circle and Subscribe via Email for a chance to grab the prize. Winner will be randomly selected and notified via email or FB message. He or she will be given 48 hours to send a response. Otherwise, his or her winnings will be forfeited and a new participant will be chosen. Prevent your nailpolish from chipping! I love when my nails are done at a salon with acrylics because the nail polish NEVER chips off. When doing them at my house on the other hand, it seems to never stay one without chipping, even for a day. So what are some tips and tricks I learned to help the polish last longer on your nails?! 1. Make sure your nail bed is completely clean of oils by rubbing them with some nail polish remover before doing anything. 2. Apply a base coat that will prevent the polish from staining your nails and give the polish something to grip onto. 3. When applying the polish do it in THIN layers as opposed to thick layers. Thick layers tend to peel off easier and quicker. 4. If you have longer nails, make sure when getting to the tip of your nail to bring the color under the nail a bit, this prevents easy chipping. 6. Once the polish is dry stick your fingers in ice water to solidify the polish and apply lotion to give your nails a slippery feel which can help the staying power of your polish! Hopefully now, painting your nails won't be such a hassle and won't have to be redone more than you'd like to do them! These two pictures are just funny shots of me and my sister pretending to be millionaires. I think we pulled it off pretty well. Okay, I know you're going to see the title and think I'm crazy... But seriously, you CAN SPLURGE even on a budget. Do you ever wonder how I am able to "Haul" so much? Because I am smart on how and where I spend my money. Who? What? When? Where? How? I'll tell you! These are some of my favorite ways to get what I want and not break the bank. Ebates is a great free website that gives you money back just for buying the things you already would buy online. There are over 1,200 online stores who participate. Just for signing up, you get a free $5 credit. If nothing else, sign up to receive $5. Quarterly (four times a year) they mail you a "Big Fat Check" or simply credit your Paypal account. Or, if you are feeling extra gregarious they will donate 100% of your savings to your choice of charity. You can even get cash back on your travel, airline, Ebay, HSN, or Groupon purchases through Ebates!!! THAT'S SAVINGS ON TOP OF SAVINGS!!! Are you or do you know a college student? SAVE MONEY ON YOUR TEXTBOOKS through Ebates. Link to your favorite online retailers through the Ebates website when you do your online shopping, and receive a percentage of your purchase CASH BACK! When your style is haute couture and your budget is strip mall, you're going to need a way to cope. "Each day at 8 AM Pacific, shop new sale events featuring the best names in women's and men's fashion and accessories, beauty, kids' apparel and toys, home décor, and travel getaways at up to 75% off. Membership is free and everyone is welcome! " On Sunday nights they have super blowout sales that are soooo amazing. Click here to sign up so you always know whats on sale. Ebay? YES!!! Ebay is one of my most shopped from sites. I browse Ebay daily, because it is constantly changing. BUY VINTAGE? Look on Ebay for great deals on vintage and pre-owned clothes and shoes. ***SUPER SAVER TIP*** I buy mostly from wholesale and "free shipping" companies located in Asia. I get things for pennies on the dollar. Of course this will not work if you are one of those people who only buy products produced in America. But I don't want to deal with all that bidding!!! Okay, then don't! When you search something, click "Buy it Now" and from "Lowest to Highest"
Love one of a kind pieces, but don't have three million dollars laying around? PROBLEM SOLVED! Visit Etsy, a site that I LOVE. Etsy is a marketplace of handmade awesomeness. It is filled with so many hand made awesome, personalized, super cool, vintage, new wave, pop culture, indie, fantastic things. It will blow your mind. I don't ever online shop without one!!! Usually companies will advertise their current promotional codes on their home pages. If you don't see one you like, below is a list of coupon websites I enjoy using. Whether you're looking for new or used, I'm sure there are many discount stores in your area. Dont over look your local thrift shops, Buffalo Exchanges, and Salvation Army. i find some of my favorite things in these kinds of stores. Your really going to feel great about your shopping when you buy from clearance sections of discount stores. Although I do not coupon, I know Dianna has dabbled in it a little. COUPONING IS THE NEWEST TREND!!! And although I have not jumped on the band wagon, I know someone who is practically pulling it! Meet Kathy Spencer! Kathy is the mother of an old friend of mine. She has truly mastered the art of couponing. Not only has she mastered it, but she even wrote a book on it. Kathy's book "How to Shop for Free" is available through her website, Amazon, Borders, Barnes & Noble, and independent bookstores. Along with the book, Kathy also teaches couponing classes, and runs a couponing website. "Like" her on Facebook HERE!